There is much less scope for originality and diversity of plan in small town houses than in those erected in the country. The limiting conditions are very severe, especially if one takes the term "Town Houses" to mean such only as are built in terraces, considering all isolated houses as being, in effect, country houses, wherever they may be built. It is obvious that in terraces it is difficult to consider aspect at all, or prospect either. These have been laid down in advance by the formation of the roads along lines determined by other considerations. All that the architect can do is to light his rooms from front and back, it being almost impossible to open windows at the side unless they overlook similar windows in the neighbouring houses at a short distance away. Further than this, the building restrictions are generally very severe, much more so than in the country. They vary in different towns, but almost always contain stipulations determining the thickness of the walls, the provision of complete party walls separating house from house to prevent a fire from spreading from one to another; the heights of the rooms, and the construction generally being also definitely fixed. At one time it was almost invariable to put some of the rooms in a basement, but this involves so much trouble in the service of the house that it has had to be abandoned, and a basement except for coals and perhaps for a larder is now rarely found, in small houses at any rate. The tendency with these is to build them with as few different floors as possible, so as to make them easy to work with a small staff of servants, or with none. This, of course, means that the houses must be extended over a considerable area of ground, and, as the frontage is usually strictly limited, this large area is only obtainable by extending the plan towards the back by means of what is called a back addition. Unfortunately this entails the formation of a narrow yard between the back addition of one house and the back addition of another, which is again cut in half by the fence dividing the two properties; and such a yard, unless very well kept, is little better than a slum. At all times it contains stagnant air, and in many instances is never penetrated by sunlight. Still, it seems to be unavoidable with small houses of limited frontage, for which a type of plan has been developed which it is difficult to depart from. Such a plan is shown in Fig. 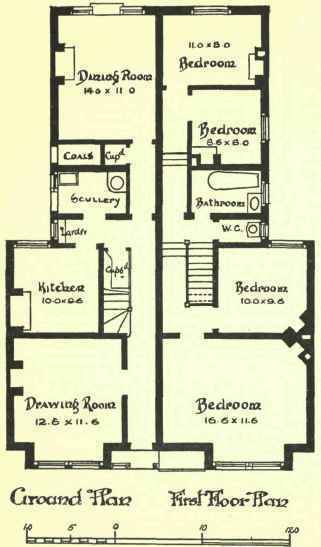 I, which illustrates two of a row of small houses built at Sydenham, having each a frontage of 17 feet. In this case a parlour or drawing-room is placed in the front, though it may be remarked that this and the dining-room are interchangeable, either room being used for either purpose as may be desired. There is only a narrow front hall or passage, so as to give as much width as possible to the drawing-room, and the hall widens immediately the drawing-room is passed, to enable the staircase to be introduced. The kitchen is behind the drawing-room, entered beneath the staircase, and with its window overlooking the narrow back yard. Three small cupboards are contrived, but only one of these has a window, and that is dignified by the name of larder, while access to the yard is obtained through the scullery, and a very small coal cellar obtained behind it. It would be possible to put this cellar in a basement by sacrificing the store under the staircase - and this is perhaps more often done than not, as then the coals can be shot into the cellar from the front and not carried through the house. The dining-room is right at the back, and has windows opening out upon the garden. The two principal sitting-rooms thus face towards front and back, so that one or other of them obtains sunlight throughout a good part of the day, and advantage is taken of such prospect as can be secured over the street in front, and over the small garden in the rear. Upstairs a bathroom is obtained over the scullery, which is kept low, thus forming what is often called a half-landing. There is a separate w.c. over the larder - much better than placing it in the bathroom, as is often done to economise space. Three additional steps in either direction lead up to two bedrooms in the front, and two more at the back. Of these four bedrooms, two are only lit by windows opening into the back yard, while the windows of the other two face to front and back, they being over the drawing-room and dining-room respectively. It cannot be contended that this is an ideal plan, but it is probably as good as anything that can be managed under these very serious restrictions. The rooms are small, but there are sufficient of them for many a small family, and such details as the positions of fireplaces, doors, and windows have been considered upon the lines already laid down in the last Volume, so as to secure as much comfort as possible in the various rooms, under very disadvantageous conditions. The principal inconveniences of such a house are the narrow hall and stairs, the narrow back yard with the overlooking windows, and the certainty that an inhabitant will hear a good deal that goes on in the neighbouring house. Serious as these are, however, there is no means of avoiding them, and they have to be submitted to almost universally. A common modification of this plan is shown in Fig. 2, the principal alteration being that of putting the kitchen in the back addition; but the outlook from the dining-room is completely spoilt, and this is the more to be regretted as the frontage is sufficient for good rooms to be obtained, and much better could evidently have been done. Everything is on a larger scale, a third sitting-room being provided by placing the drawing-room on the first floor, where space is sacrificed in order to obtain light to the staircase. Such a house is, however, quite common, especially in the large towns of the North of England, for which it is planned, there being a detached wash-house and an e.c. at the back, near the exit to a back lane.